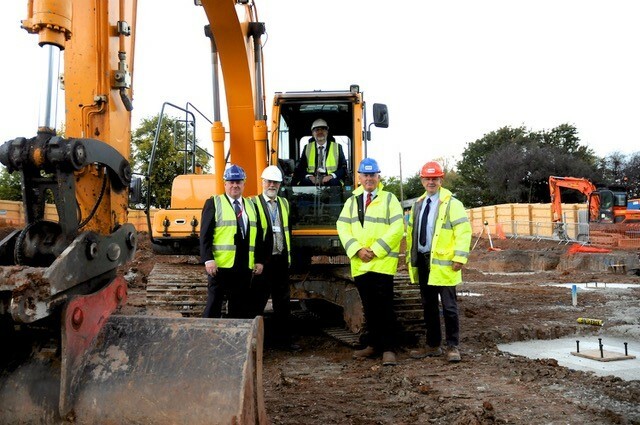 Work has started on a brand new £3.9m Performing Arts and Languages Building at Rushcliffe School in West Bridgford. Nottinghamshire construction company, Robert Woodhead Ltd, has been taken on to deliver the building, which is set to be completed ready for the start of the academic year in 2018. The facility will provide the school with brand new teaching spaces for music, drama and languages, broadening the opportunities for students in these specialist subjects. Rushcliffe School is part of the Trent Academies Group, which has secured funding from the Government’s Condition Improvement Fund (CIF 2017) to facilitate the project. “The school is heavily oversubscribed due to its Ofsted Outstanding Grade and having achieved ‘World Class’ status. Our highly successful Modern Languages department will receive brand new facilities, and allow us to regroup the Mathematics department in the space vacated by Languages. The new Drama and Music departments will enhance our curriculum delivery in those areas, and provide excellent facilities for school events. The 2,200 square meter modern building will be built to a high specification, designed to be energy efficient, built with a steel frame and a mix of brickwork and cladding. The project will be delivered by Woodhead Education, the specialist arm of Robert Woodhead Ltd. During the process of the build the site team will work alongside the school to offer work experience opportunities, as well as maintaining positive engagement with the local community. “This is a fantastic project to be working on. We do a lot of work in schools across Nottinghamshire and the East Midlands. To be working on such an impressive new-build project is a great opportunity for us. Work began on the project this summer and will continue until summer 2018.